Earlier this year I did a search on Amazon for "dye-free ibuprofen." I had read something that said the coating on ibuprofen isn't good for us, and since we try to be as natural as possible with our products, I figured I'd see what else was out there. I was stoked when b+b came up in my search - as not only dye free but as a one-to-one company! According to a Nielson Global Corporate Sustainability Report, 66% of consumers are willing to spend more on a product if it comes from a socially conscious brand. That is definitely true for me! I was thrilled to order an ibuprofen that is better for my family and know that I was doing something good for the world at the same time. And b+b does have a commitment to providing their medicine at the same or a lower price than comparable alternatives. Since we first tried it, I've been telling everyone how cool this company is. In fact, when I tell people the above statistic, they frequently say something like, "how do you find these companies?" And I share how I am a success of targeted marketing - the more socially conscious brands I buy from, the more show up in my search results. Another reason I love b+b so much is that their commitment to running a values-based company does not stop with their mandate to donate a product (through americares). They also take care of their customers by providing the dye free options and easy to use design-friendly packaging. Additionally, they have a commitment to taking care of the earth by using as little packaging as possible. 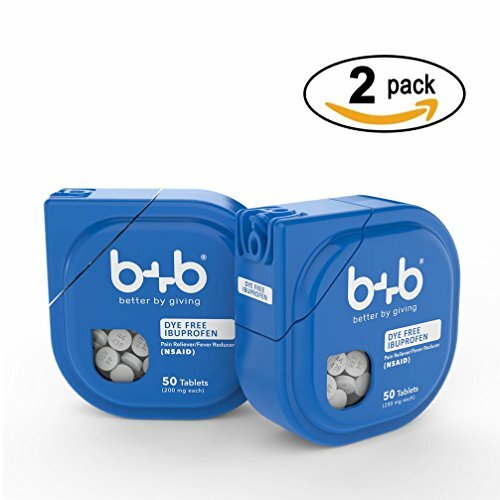 One of my personal pet peeves over the past few years has been natural or organic companies that send their products in a ton of plastic - and this is not the case with b+b! It's also worth mentioning that they have other options besides ibuprofen. You can purchase acetaminophen or naproxen sodium as well. So here's to relieving minor aches and pains in your own body while helping relieve them in someone else's! This wonderful product from this super-star company is available on Amazon and at Publix, or you can buy direct from their site.